A man locked in a standoff with Fort Worth SWAT officers for more than five hours Tuesday has surrendered and been taken into custody. At 4:45 p.m. the barricaded man, later identified by police as John St. Angelo, was dragged bloody and injured from a home on Permian Lane by SWAT officers. According to police, St. Angelo was suffering from multiple self-inflicted gunshot wounds and was placed on a gurney and walked toward an ambulance before being transported to John Peter Smith Hospital in Fort Worth. While his exact condition is not known, police said St. Angelo was conscious as he left the scene; MedStar said he was being treated for several minor injuries. Throughout the standoff, police were unable to confirm the identity of the man barricaded inside the home and said they were only following up on a tip where the caller said there was a man inside their home on the 6800 block of Permian Lane that may have been responsible for the murder of Realtor Suzanne Parsons the day before. The suspect in the stabbing death of a North Texas real estate agent is in police custody following a standoff in Fort Worth. At 11:15 a.m. Tuesday officers were dispatched to the tipsters home, which is located less than five miles from Monday afternoon's murder scene on the 4200 block of Heritage Trace Parkway. With the home surrounded and access to part of the neighborhood blocked off, the man held officers at bay for five hours while occasionally firing shots at officers and dodging canisters of tear gas. At other times, police said the man could be heard ranting and raving on an open phone line. Shortly before 5 p.m., more than five hours after the standoff began, it came to a peaceful end when the man surrendered. A short time later police were able to confirm the barricaded man's identity as John St. Angelo. A search of Tarrant County marriage records shows that two people named John St. Angelo and Suzanne Parsons were married on July 2, 2010. On May 20, 2013, a Tarrant County civil court granted Parsons a temporary restraining order against St. Angelo. On Nov. 21, 2013, the order expired when Parsons, who represented herself, did not show up for a routine court hearing that would have kept the TRO active. At this time, investigators have not confirmed any relationship, marital or otherwise, between the barricaded man and the murder victim and they have not named John St. Angelo a suspect in Suzanne Parsons' murder. 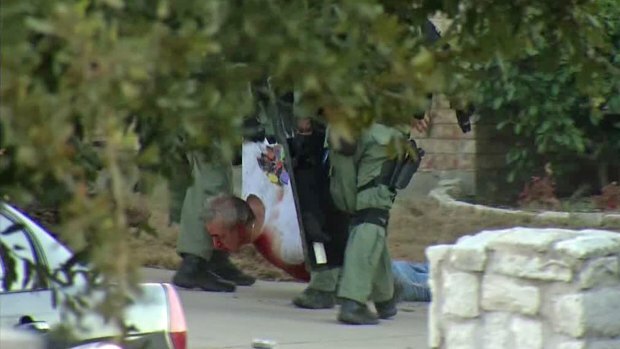 A man locked in a standoff with Fort Worth SWAT officers for more than five hours Tuesday has surrendered to police. The first officers were called to the scene at about 11:15 a.m. SWAT was called to the scene at 11:36 a.m.
For some time, police and SWAT searched the neighborhood and an area around a home mentioned in the tip. Chopper 5 was initially over the scene but moved away to observe restricted airspace to protect both the helicopter and police officers on the ground. NBC 5 did not offer a livestream of the event as to not divulge the position, and thereby compromise the safety of, any of the officers on the ground. Shortly before 2 p.m., NBC 5's Ray Villeda reported from the scene that at least six loud pops that sounded like gunfire were heard in the neighborhood. Villeda tweeted that the pops were followed by a loud bang. At around 2:30 p.m., from video seen from Chopper 5 it appeared SWAT officers moved in toward the home and threw a gas canister through a second-floor window. The canister was thrown back out of the house where it started releasing the gas. Several other attempts to throw gas into the home were not successful. Parsons' co-workers arrived at the neighborhood and said the entire situation is surreal and that they are shocked that the tragedy seems to be drawing to a close so close to where they live. At 3:25 p.m., SWAT officers continued to position themselves around the home -- at times pulling a large armored vehicle into the driveway, possibly breaching the garage, only to back out again. At about 3:30 p.m., NBC 5's Scott Gordon tweeted that the SWAT team was instructing the person inside the home to surrender saying, "Come out with your hands up. You will not be harmed. Do it now." At 4:30 p.m., Gordon reported SWAT officers can hear the man "ranting and raving to himself" on an open line, though he wasn't communicating directly with negotiators. SWAT officers mobilized a small, motorized device that appeared to remotely be driven into the home's garage just before 4:30 p.m.
At about 4:45 p.m., the person inside the home surrendered and the standoff was over. Police have revealed few details about the Parsons murder investigation other than that she was stabbed to death and investigators believe she knew her attacker. NBC 5's Ray Villeda and Scott Gordon contributed to this report.